It's easy to lose focus when you run a busy startup. Sometimes you need to be reminded about why you started in the first place. This mental refresh can come from anywhere and when you least expect it. But when it happens, you want to express gratitude to those involved and do what you can to help them. 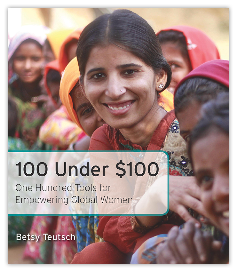 So for this post, we would like to publicly thank author Betsy Teutsch not just for including us in her new book 100 Under $100: One Hundred Tools for Empowering Global Women (100 under $100) but for reminding us of our mission to solve the world's clean water crisis. We recently met Betsy at one of her book events in Northern California sponsored by Dining for Women, where she kindly allowed us to present our product. Betsy's knowledge of the water-related challenges poor families face is impressive and this is well reflected in the book. More important to us, is her support of rainwater harvesting as a solution for both clean water and small scale farming. Her book mentions almost of the work we have done in developing countries including our Guatemala trial and our 2 Dollar Tank project. Yet the best part of 100 under $100 is the way it puts together all the technologies and products currently available to empower women to innovate their way out of poverty. In our view, the book is the perfect NGO companion because of the way it indexes with pictures and reference information all the tools one might need to achieve an objective. Even experienced social entrepreneurs will find it useful for the way it presents alternatives. We plan on relying heavily on the book as we plan our next product for the developing market.